Welcome to Music City, Nerd Nation! As Minnie Pearl used to tell the audiences at the Grand Ole Opry, “We’re just so glad you came.” With the grand occasion of the Stanford women’s basketball team in the Final Four, I’ve teamed up again with fellow Stanford alum Chris Chamberlain (’89) to give you a list of essential eats in Nashville. While you’re in town to watch the Cardinal hopefully you’ll take advantage of some of the qualities that have qualified Nashville as the latest “It City” according to national media. Here you’ll encounter some of the greatest Southern hospitality, food and live music within the compact area of downtown around the Bridgestone Arena and the new Music City Center (so big you can see it’s green roof from space, though there’s no truth to the rumor that there are goats grazing on the roof.) Here’s a quick guide to dining and entertainment while you’re in town. Husk–An outpost opened up by celebrated Charleston, South Carolina-based chef Sean Brock. Etch–A celebration of global cuisine. The Farm House–Their motto “local farms create local plates” says it all. All six of these spots are within walking distance or a quick cab, Uber of Lyft ride from the arena, and all have opened within the past year or so. Unfortunately, they’re wildly popular and tough places to get a table on a weekend. However, it’s worth dropping by and seeing if you can eat at the bar or get a walk-in spot for some of the best upscale Southern and farm-to-table fare in town. The Southern Steak and Oyster – The name says it all, and they have a bustling bar business. Amerigo – Good family-friendly Italian food at reasonable prices. Demos’ – An interesting amalgam of traditional Soutyhern dishes plus Mediterranean classics. Somehow it works, and they turn the tables quickly at this inexpensive eatery. 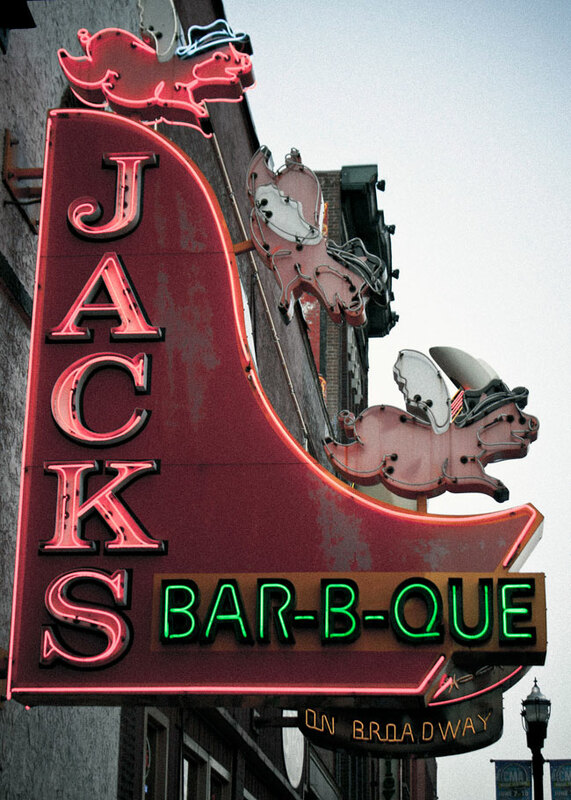 Jack’s BBQ – Just look for the neon flying pigs over lower Broadway and you’ll find some excellent barbecue inside. Peg Leg Porker – A championship barbecue competitor, the proprietor of this meat emporium opened his own restaurant last year to great acclaim for his West Tennessee-style ribs, pulled pork and chicken. And he does indeed have a peg leg. Ask him to tell you the story. Bolton’s Spicy Chicken & Fish–People in Nashville really like it hot, and this place is a popular purveyor of piquant poultry and piscatory dishes. Swett’s Family Restaurant–One of the nation’s oldest soul food joints serving up solid southern food cafeteria-style. Arnold’s Country Kitchen – Only open on weekdays during the lunch, you must make a stop by here for quintessential Southern cooking. It’s nothing fancy, and the line may stretch out the front door, but it moves quickly. Recognized as an “American Classic” by the James Beard Society and featured on Diners, Drive-ins and Dives, this a mandatory stop for the real deal. 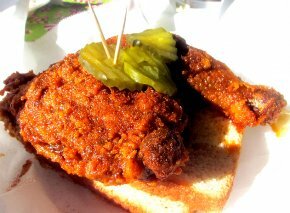 Hattie B’s Hot Chicken – Hot chicken is perhaps Nashville’s most iconic food. We’re not just talking about spicy. It’s infernal. Here’s a description of Nashville’s original hot chicken shack, Prince’s. However, Prince’s is pretty far from downtown, so try Hattie B’s in Midtown for a comparable experience. Robert’s Western World – Thanks to no cover charges and unbelievable musicianship, all the honky tonks downtown are worth at least a visit to hear great music. It’s easy to stroll from bar to bar to find your favorite, but the locals’ choice is Robert’s Western World. It really is a boot store during the day, but at night Robert’s features the best bands downtown, and their “Recession Special” is tough to beat. Five dollars gets you a fried bologna sandwich, a bag of potato chips, a cold beer, and a choice between either a Moonpie or a Goo Goo Cluster. It’s the perfect late-night snack to power you through until tomorrow.